It’s already been established that Rice Krispies are not the only cereal treat on the sweet circuit. 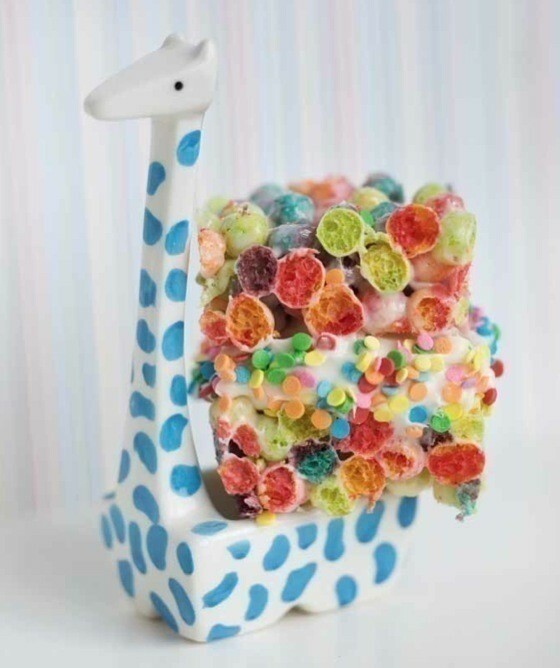 But for the most sacchariferous and certainly the prettiest alternative, why not try a rainbow-hued cereal? You can then create some double rainbow magic by slicing your tutti-frutti-toned tidbits and stuffing them with frosting and sprinkles. If you are what you eat, than eaters of these treats are colorful, rich, and absolutely fabulous. Posted by Jessie Oleson from Seattle, Washington, United States • Published 14th December 2011 • See Jessie Oleson's 17 projects » © 2019 Jessie Oleson / Running Press · Reproduced with permission. Generously grease a 9-by-13-inch pan. In a large saucepan, melt the butter over low heat. Add the marshmallows and stir until completely melted. Remove from heat. Add the cereal. Stir with a wooden spoon until well coated. Spoon this sticky mixture into the prepared pan, pressing down with either clean, slightly wet fingers or the back of the spoon to make sure it is evenly and firmly packed into the pan. Set aside. Let the treats cool completely, then cut into squares of any size you’d like. Using a very sharp knife, cut the squares in half horizontally (like a bagel). Apply a liberal dollop of frosting to the bottom half, then top with the other half to form a sandwich. Apply rainbow sprinkles to the exposed frosting on the edges to really trick out your treats.